So, you have chosen a window contractor. You have picked out the perfect window style and selected the most energy-efficient material for your home. Now, you are all set to pick an installation date, right? Well, there a few other considerations first. Make no mistake, both framing material and window styles are both important elements to a good window. But there is one more element: glass. Glass makes up most of the area of a window. And despite the fact that we can see right through it, there is a lot going on that we can’t see. In fact, your choice of glass impacts the performance of your window much more than you might think. The days when windows had just plain old panes of glass are gone. The glass you choose for your windows can either make it very energy efficient, or the complete opposite. This is why it is vital to make your choices wisely, so you can get the best performance out of your window replacement project. To begin with, let’s explore some of the options that are available to you. What exactly is a window glazing and what does it do for the glass of your window? Glazed (or double and triple glazed) windows are made up of two or three panes of glass instead of just one. This is where the energy efficiency comes in. The panes trap a pocket of air between them, which creates a tight seal, and an extra layer of insulation. To increase the energy efficiency even more, the space between the panes can be filled with a gas like argon or krypton. This added insulation does wonders for your windows’ performance. It will keep the heat in during winter, and the cool in when summer comes. 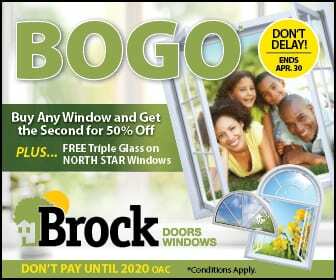 Here at Brock Doors and Windows, we offer high quality double or triple pane windows that will cut the energy transfer in half, which can significantly decrease your monthly energy bills. Another great feature about glazed windows is that they reduce outside noise, keeping the interior of your house nice and quiet. This comes in handy in the event of a thunderstorm, or the loud barking of your neighbor’s dog. Tints are a special material that alters the color of glass. Common colors for windows include bronze, gray, green and blue. Bronze or gray tints afford the most protection from light, while green and blue allow a little more sunshine to come through. The purpose of tinted glass is to minimize how much light can penetrate your windows. This makes tints are a very useful option if youTor home has little or no shade. Tinted windows are great for keeping the inside temperature at comfortable levels, and reducing glare. Keep in mind that if you have inside plants, it’s best not to install tinted windows, as they will not be able to get enough sun to stay healthy. Brock Doors and Windows are here for you. If you want to schedule a free consultation, or simply are curious to learn more about what glass options are available, give us a call. For decades, we have been proudly serving home owners just like you with quality window replacement installation in Brampton, ON, and we can’t wait to help you with your project.